TRAACS is a Nucore Software Solutions' flagship product. TRAACS keeps you one notch ahead of the rest. 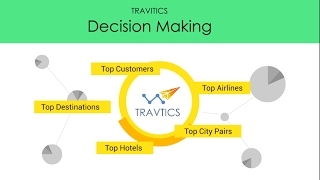 It is a complete software solution for Travel Agency requirements offering interactive modules, accurate accounting and streamlined processes.With TRAACS data can be analysed in multiple ways which are graphic oriented and easy to understand. One of the core features of TRAACS is that it fits into your agency regardless of the size of your organisation. It also integrates with all major GDS. Take your business ahead with TRAACS! Double entry system with auto posting. Drill down facility from balance sheet upto ticket booking. Document reversal, auto posting and posting by approval methods. Hassle free year end accounting with just a single click. Multi Currency, Multi Branch, Multi User & Multi Cost support. Local support and its tracking for the customers. Transparency in the entire working process assures quality. Offers a wide range of MIS and DSS reports. Supports web based MIS reports. Provides a powerful query system that meets all your reporting requirements. Supports customizable reports and graphical reports generation. Easily create and print invoices. Single invoice for multiple products and services. Auto invoicing according to the requirement of the customers. Facility to email statements and Invoices directly from the system. Edit the ‘Invoice Printing Data’ without affecting the original data. Expert assistance through Support Incident Tracking system (SiT). Detailed Version Control: If an invoice is modified, system will keep different instances internally (SHA-1 encryption 2048 bit). Lock & Unlock Facilities: User wise, account wise & cost centre wise. Entirely a system oriented approach. No need of vast knowledge in accounting. Dependency of the user is reduced. Back end accounting can be easily done. Job card creation and tracking till closing. Credit card reconciliation, corporate card reconciliation, bank reconciliation. Airline wise class management and MIS Reporting. LPO encashment, LPO credit management & tracking. Three gifted young tech savvy entrepreneurs synched their prismatic friendship algorithm into their business and then shaped not as a solution provider, but a solution builder. Nucore, being the master in the travel domain with challenging aptitude and influential efficiency for rewrite the travel agency back office experience. As a customer, I am impressed and blessed by the comprehensiveness and lucidity of their thoughts. During our business requirement conference, I noticed, they focused, passionate, and think above and beyond the scope. The TRAACS and their (BI) Business intelligence tool truly unlocked the potential and accelerate the scale of our business. I am pretty confident Nu core’s excellence and efficiency not only limited Asia, Middle East and Africa, but an acceptance in entire travel trade spectrum in the near future. I wish them all success. There are different companies providing software solutions in the market but let me be frank Nucore and its most comprehensive software solution has the capability to provide a client whatever he asks for. Integrated view, combined with a rich customer know-how, accompanied with cutting – edge expertise, offers client one of its kind experiences.The entire company with its team and products included, can be summed up in one single word i.e. MARVELOUS. We really once again appreciate the work of the whole team. Keep it up and all the best. General Manager, Hala Travel Management. Almost all technology projects engender a reasonable amount of fear related to its budget, its impact on the working of business and so on. When Hala Travel Management needed to upgrade their front & back office all these concerns were discussed.We needed to incorporate our own world class experience from around the globe and ensure this was implanted into the DNA of the new system. Regardless of how good the technology itself is, you need a team with passion, pride in delivering a great result, the courage to speak up and the patience to overcome unforeseen obstacles. All these things were found in Nucore and the team. Thanks to their dedication, perseverance and sheer hard work due to which we now have state of the art systems and are ideally positioned to deliver a superior customer experience. Our newly added customers - Skylink Travel & Tours Limited - Tanzania, Worldlink Travel & Tours - Tanzania, Magical Holidays. Privilege of working with most of the well-known concerns helped us to capture international markets. We help them in solving business problems, increasing visibility in today's networked world where customers have become progressively empowered. We involve in our clients most celebrated business episodes to bring deep practical expertise and a hands-on approach to build competences and deliver results.